By Matthew D. Sullivan, B.A. When writing a research paper, there are some predictable traps that students tend to fall into time and time again. You might have heard of a few: failure to properly cite sources, waiting until the last minute, and not proofreading before submitting the paper. However, these mistakes have more to do with poor self-management than the writing process itself. There are, what I would consider, even greater and more common mistakes that all writers make (beginners and experts) that are never talked about. These less obvious mistakes tend to be roadblocks between a good paper and a great paper. So if you are ready to take that leap from good to great, consider these 3 hidden mistakes and the steps you can take to avoid making them. 1) You do not know how to procrastinate: (WHAT?!) Yes, you read that correctly. Writing a research paper sooner rather than later is always a great suggestion. 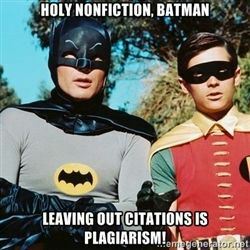 However, even if you start a research paper three months before it is due, you may not have any ideas right away, and this is completely natural! For example, you may have your question and know your topic very well, but there may exist that question in your mind of what your discoveries and research mean. Sometimes, the ideas are right there in front of you and you can easily put them into words for your readers to understand. Sometimes, the ideas are going to ‘pop’ into your mind without warning, especially when you least expect it. In other words, at times it is best to let some of the ideas come to you rather than to go searching for those ideas. This does not mean that you wait until the last minute to write your research paper. What procrastination means from the perspective of the writer is that some ideas can wait, but never are you not thinking about your research, for a researcher always needs to be thinking about their research. 2) You’re not writing your own opinion: Your research paper is your opinion. However, this does not mean that you are specifically writing, “I think that…” or, “In my opinion…” Think about the moment when you were first assigned a particular research paper. If you were able to choose your topic you likely chose it because you are interested in the subject, you can relate to the questions being asked or you have an existing understanding of the material. And these are reasons why other people read research papers, because they too have interest in your question and topic, can relate to them, and can understand them. Though you are not stating it directly, you as the researcher are saying that “because of my research, I am allowing certain questions to be asked that, in my opinion, will allow this research to continue in a direction that I deem both necessary and interesting.” It is this indirect opinion that is being communicated to your reading audience, and it is this opinion that your reading audience is most eager to read. 3) Before you start your research, you don’t know yourself: Before asking your question or choosing your topic, there exists the need to know what question you want to ask and what topic you want to choose. Only you can decide these things, because only you know your interests, what you can relate to, what you understand. And these aspects can only be known if you first know yourself. So, just as you would with any research, ask yourself these questions, “What are my interests?” and “What do I understand?” Once you have answered these questions, you can then have a better idea of the topic that is a best fit for you. Next, discover what you already know, or don’t know, or even want to know, about the topic(s) available. This allows you to understand how much research you need to do and how much work you have ahead of you. Lastly, you can finally reveal to yourself and others what you have discovered. Additionally, knowing yourself involves knowing certain aspects like how much work you can handle at once, how much time you need to schedule in your day to complete a certain amount of work, or which suggestions and tips will help make your writing the best that it can be. Once you know yourself, you will then know your research, and once your research paper is written, others will know your research as well. Writer BIO: Matthew Sullivan is a senior in the Hotel, Resort and Tourism Management program and is also minoring in Business Administration. He is a tutor in our Writing Center and is available to meet with you on Tuesdays 6-9 pm, Wednesdays 10-11 am & 6-9 pm, and Fridays 10-11 am & 1-2 pm. Matthew also tutors for Principles of Economics and leads our Cultural Enology study group.